Note : To obtain an aligned printout please download the (6798 kb) version to your machine and then use respective software to print the story. 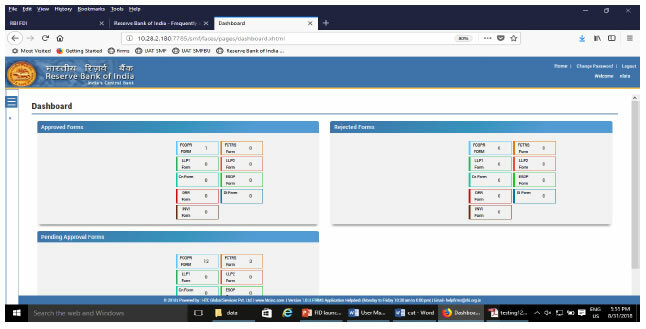 1.1 The Reserve Bank, in the First Bi-monthly Monetary Policy Review dated April 5, 2018 announced that, with the objective of integrating the extant reporting structures of various types of foreign investment in India, it will introduce a Single Master Form (SMF) subsuming all the existing reports. 1.2 In order to implement this announcement, the Reserve Bank is introducing an online application, FIRMS (Foreign Investment Reporting and Management System), which would provide for the SMF. FIRMS would be made online in two phases. 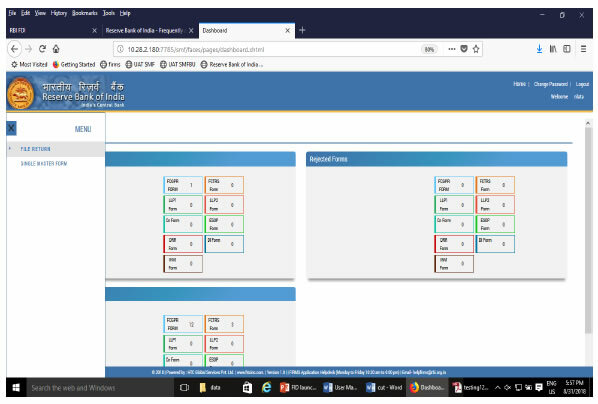 In the first phase, the first module viz., the Entity Master, was made available online. Instructions in this regard were already issued through A. P. Dir. Series Circular No. 30 dated June 07, 2018. 1.3 In the second phase, the second module is being made available with effect from September 01, 2018. With the implementation of SMF, the reporting of FDI, which is presently a two-step procedure viz., ARF and FC-GPR is merged into a single revised FC-GPR. 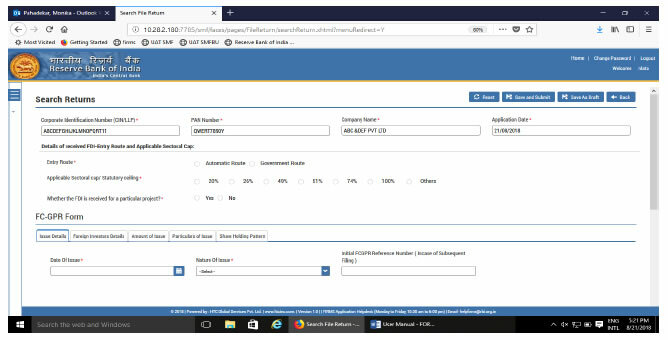 With effect from September 01, 2018, five forms viz., FC-GPR, FC-TRS, LLP-I, LLP-II and CN were being made available for filing in SMF. The other three forms viz., ESOP, DI, and DRR are being made available for filing with effect from October 23, 2018. Form InVI would be made available subsequently. 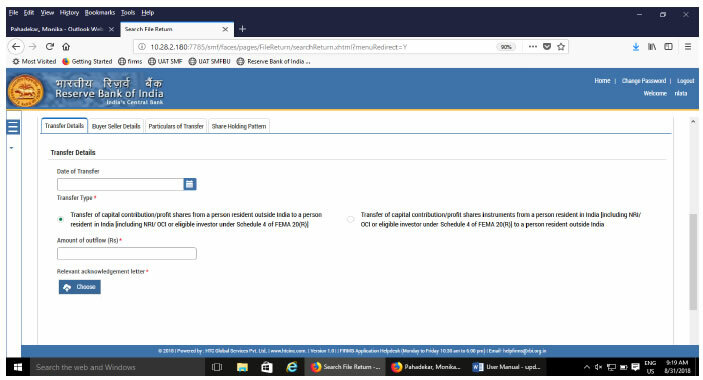 With effect from September 01, 2018, all new filings for the 5 forms and other three forms viz., ESOP, DRR and DI with effect from October 23, 2018 have to be done in SMF only. 1.4 The first module was made available to the public for data entry between June 28 (at 1:00 PM) and July 12, 2018. The date was extended till July 20, 2018. For those companies which could not register within the stipulated time period may register for the entity master with effect from September 01, 2018. However, they shall provide the reasons for not making registration within the time period along with the authority letter. 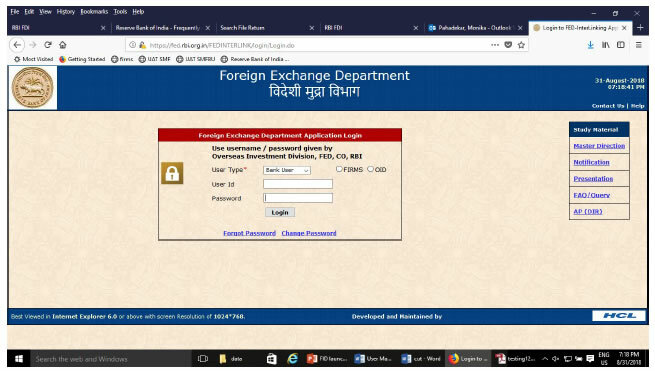 FEMA 20(R) Foreign Exchange Management (Transfer or issue of security by a person resident outside India) Regulations, 2017 dated November 07, 2017 and as amended from time to time. 1. 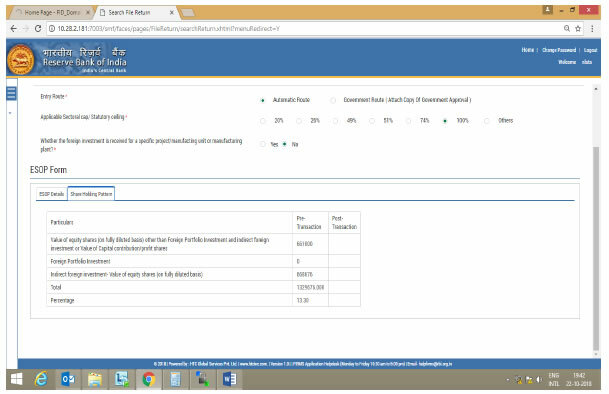 FIRMS: An online reporting platform for reporting of foreign investment in India in SMF. FEMA 20(R) prescribes for the reporting of foreign investment in India through various returns. FIRMS provides a one stop shop, 24*7 online reporting facility for the applicant. 2. SMF: A master form which provides for the reporting of 9 forms for foreign investment viz., FC-GPR, FC-TRS, LLP-I, LLP-II, CN, DRR, ESOP, DI, InVi. With effect from September 1, 2018, five forms viz., FC-GPR., FC-TRS, LLP-1, LLP-II and CN were made available. Other three forms viz., ESOP, DI and DRR are being made available for filing with effect from October 23, 2018. Form InVi would be made available subsequently. 3. Business User: The applicant reporting the for the transaction in Single Master form at FIRMS. A BU can use his login credentials for only the entity that has authorized him/her to report the transactions. If the person wants to act as a BU for another entity, he must register himself separately. Further, at the time of registration, BU has to select the IFSC code of the bank which would approve the eKYC (explained under the head “Registration of Business User”)and the reporting would be made in SMF. 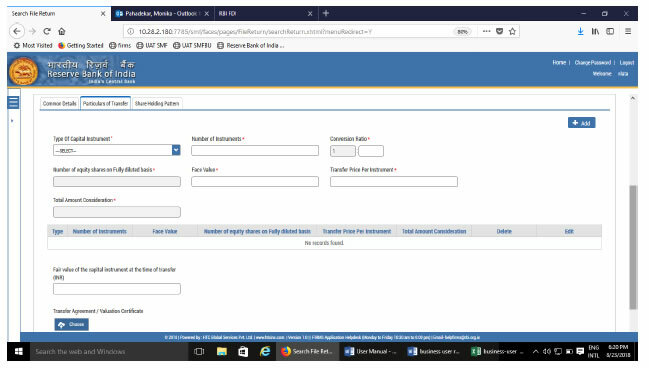 In case the IFSC details are changed i.e BU wishes to submit the reporting to another branch or another bank, the entity being the same, he/she needs to repeat the registration process for Business user with the new IFSC code and obtain separate Login. 4. E-KYC: Every business user has to be eKYC verified before any reporting can be made in the Single Master Form. This would ensure that only genuine Logins are made available in the FIRMS application. All eKYC would be verified by the AD banks. 3. 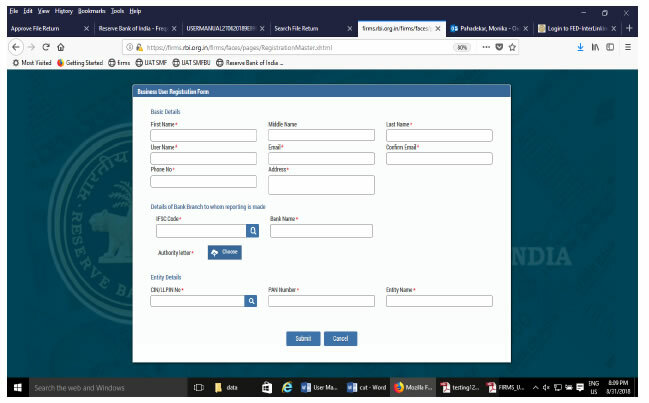 Registration for Business User. Step 2 : At the Login box, click on Registration form for New Business User. User Name User name for the BU. It shall be unique. Phone No Mobile No of the BU. IFSC code Select the IFSC code of the Bank branch to whom the reporting would be made. This field shall be carefully selected so that the reporting is made to the correct branch of the bank. The applicant shall be versed with the working model of his/her bank for the foreign investment reporting in terms of the branches which are operating for the approval/rejection of the reported forms in the FIRMS application. Not all branches are incorporated in the FIRMS application, but only those as specified by the respective bank. If the applicant is unable to find its respective branch under the IFSC code, he/she may contact its branch for clarification on this issue. Company CIN/LLPIN Select the CIN or LLPIN of the entity of which the foreign investment is being affected. i.e. the indian investee company. Step-4 : Click Submit button. In case any error is displayed, rectify the same and click Submit button. Step 5: A Message “Record Saved Successfully” is displayed at the top of Login box. After BU submits the registration form, the same will have to be verified by the AD Bank Branch concerned. The approval/ rejection of the same would be communicated through email notification to the BU. Step : 2 Enter User Name and default password as provided via email notification. Enter captcha and click submit. Step 3: Upon first Login, BU would be prompted to change the password through a pop-up window. Enter the details and submit. Upon success, Message “Password changed successfully” would appear on the Login Box. Step 4: Enter user name, new password and captcha in the Login Box and click submit. The user would be taken to his/ her workspace. Upon subsequent logins, the BU may enter username, set password and captcha in the Login box and click submit. The user would be taken to his/ her workspace. In case the user forgets his /her password, the following steps shall be followed. Step 1 : Click on forgot password in the Login Box. Step 1: Login into SMF and reach your workspace. Click on the left navigation button and select Single Master Form. Step 2 : Click on drop down menu “Return Type”. Select “Form FC-GPR” and click on Add new return. The user will be taken to form FC-GPR. Entry Route* Select Automatic or Government as applicable for the investment being reported. In case the Government route is selected attach the requisite Government approvals. Clarification: where the company belongs to a sector with mixed entry routes, for example brownfield pharmaceuticals where up to 74% is under automatic route and beyond up to 100% under Government route. If the investment being reported is under 74%. The entry route selected shall be automatic and in case the investment being reported would result into foreign investment beyond 74%, the entry route selected shall be government with relevant government approvals attached. Applicable Sectoral cap/ Statutory ceiling* Applicable sectoral cap as per FEMA 20(R). Clarification: where the company belongs to a sector with mixed entry routes, for example brownfield pharmaceuticals where up to 74% is under automatic route and beyond up to 100% under Government route, the applicable sectoral cap would be 100%. Whether the foreign investment received is for a specific project/ manufacturing unit/ plant? Select Yes or No as applicable. Brownfield/Greenfield Enter brownfield or greenfield as applicable for the investment. The complete form is arranged into two parts, Common Investment details and “Form FC-GPR” which is further arranged into 5 tabs. 4. Merger/ demerger /Amalgamation ……along with attachment of relevant approvals from the competent authority. This also includes cross border mergers which requires filing of FC-GPR as per Foreign Exchange Management (Cross Border Merger) Regulations 2018. 8. Shares issued upon exercise of ESOPs…along with the along with the reference number/identification number for the form ESOP filed for the issuance of ESOPs. 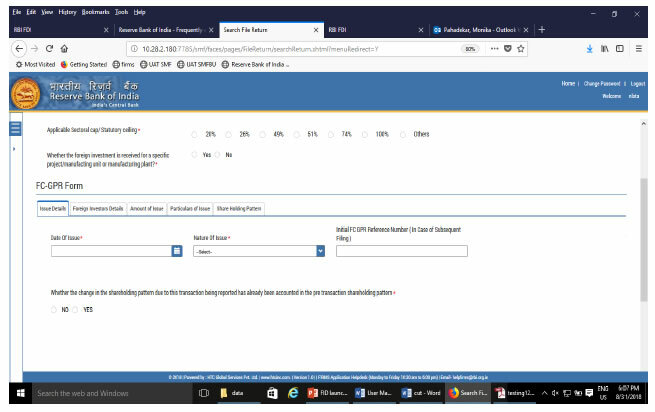 Where the form ESOP is filed through physical filing, the same may be mentioned in the reference number/identification number field as “filed physically” with the copy of acknowledgement letter/ application made as “other attachments” of the form in tab 5. If the form ESOP has not been filed by the applicant for the issuance of ESOPs, the same may be declared as a separate attachment within “other attachments” of the form in tab 5. Initial FC-GPR reference number (In case of subsequent filing) Non-mandatory. This field is applicable where the capital instruments issued are either partly paid up or share warrants where Form FC-GPR is filed multiple times for one allotment, as and when the remittance is received. 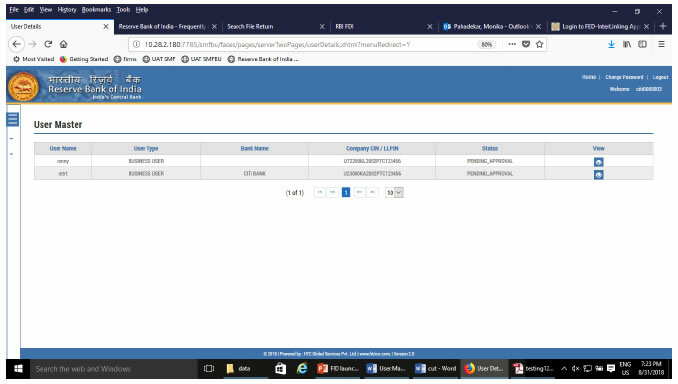 Enter the reference number, if any, which could be Ebiz application number or the acknowledgement number for the previously filed FC-GPR for that particular allotment. 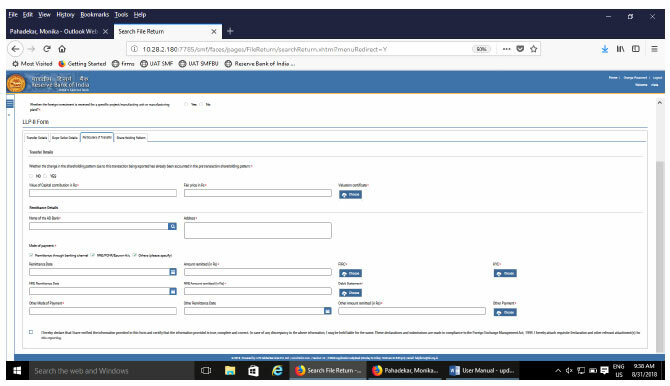 Please give the details of the allotment and payment schedule as an other attachment in the “other attachment” of the form in tab 5. In case Yes is selected then there will not be any change in the shareholding pattern for this transaction being reported. In case No is selected changes are reflected in the shareholding pattern for this transaction being reported accordingly. For understanding refer to chapter on Shareholding pattern. Number of investors Enter the number of foreign investors to whom the capital instruments have been allotted in the issue being reported. Only that number of foreign investors can be entered in the form. For example, if the number of investors entered is 3, details of only 3 foreign investors can be added. In case, more number of investors (in case of incorrect number filled), please change the number in this field and then proceed ahead. 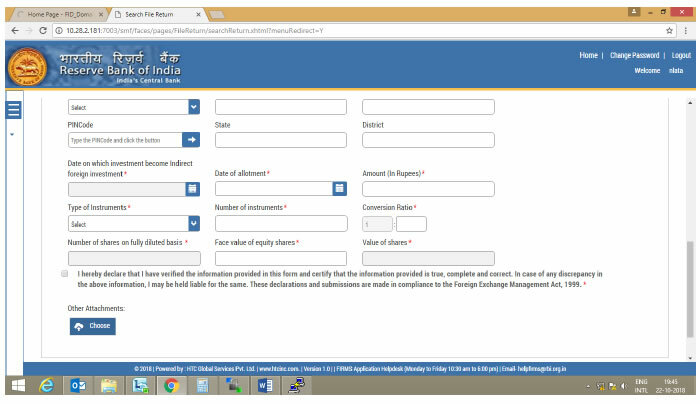 Name : Name of the foreign investor (Ensure that the name is same as in the FIRC or KYC). Country of residence Country of residence of the foreign investor. In case the investor belongs to Pakistan/Bangladesh, Government Approval shall be attached in the attachment “Government Approval” of the common details page. Constitution/nature of the investing entity (Specify whether) Select Constitution/nature of the foreign investor as applicable from the drop down menu. Number of instruments Enter the number of instruments issued. For participating interest/rights in oil fields enter the value as 1 (one). Face value Enter the face value of the equivalent equity shares. In case of CCDs/CCPs /share warrants do NOT enter the face value of CCDs/CCPs/share warrants as it will not give the correct shareholding pattern. For participating interest/rights in oil fields enter the value as 0 (one). Premium Enter the value of premium, if any, else enter 0 (Zero). Issue Price per instrument Enter the Issue price per instrument. Amount of Consideration Auto calculated as Issue Price per instrument multiplied with number of instruments. After entering all details click on “Add issue particular” and check whether the details are reflected in the adjoining table and verify the same. In case any of the details entered needs to be modified click on the edit icon under “Edit/Update” head of the table. This would populate the details in the respective fields. Modify and then click on “Save” button, this will save the details in the table again. If the details needs to be deleted entirely, click on the delete icon. Further, in case the investor has been allotted more than one capital instrument in the same allotment, add the details using the above procedure. Multiple details would be added as different rows in the adjoining table. In case the investor has been issued equity shares of different face value, for example, 100 equity shares of face value 10 and 50 equity shares of face value 20, then enter the details as two different rows and NOT a single record. 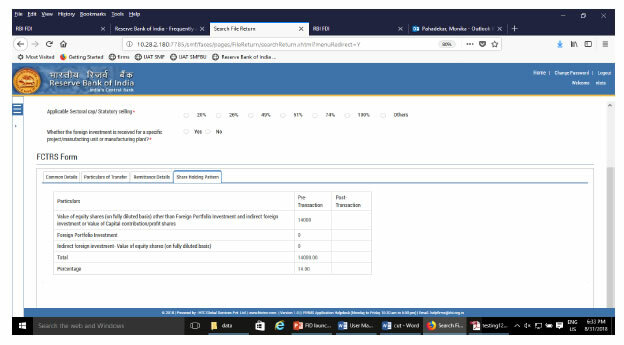 Whether the remitter is different from the foreign investor Please select “NO” if the remitter is same as the foreign investor to whom the capital instruments have been allotment. In case the two are different (third party payment, if permissible), Please select “YES” enter the details viz., Name of the Remitter, Country of remitter, relationship between Remitter and foreign investor and attach the requisite documents. “Value of Capital instruments in Rs”- Enter the value of capital instruments that are being swapped for the allotment of the instant capital instruments in this allotment. “Value of fund payables in Rs”- Enter the value of fund payables for the allotment of the instant capital instruments in this allotment. Others Select in case of any other mode of payment. Attachments: related documents, if any, as per the mode of payment and to be attached at the “other attachments” at tab 5 in the form. Multiple mode of payment Select this option if the total payment has been made through more than one mode or through one mode but multiple tranches. For example, if the allotment is of Rs 10 crores and the investor, lets say is an NRI, has paid the same as, Rs 5 crore through inward remittance and Rs 5 crore as NRE/FCNR. “Amount in Rs”-Total amount through all modes of payment. “Multimode Payment details”-Specify the individual mode of payment and amount received through that. 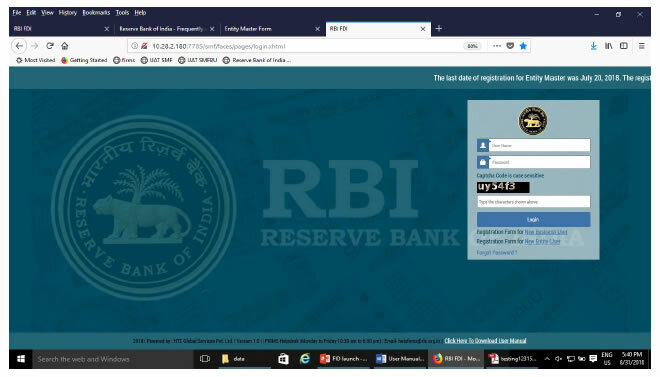 Attachments: “Relevant documents from RBI/GOI and related documents”: Attach the related Government approvals or RBI approvals, if any and any other related documents as applicable for the mode of payment as specified for the individual mode of payment. For allotments which does not involve any remittances, such as bonus issue, merger/demerger etc., select the mode of transfer as “others (please specify)”. A new field will pop-up as “others”. Enter “non cash transaction” in this field”. In “Date of remittance” select the date of allotment and in “Amount of remittance” enter 0 (zero). Leave the FIRC number blank. 4. will be refunded, if so please be guided by proviso to para 2(3) of schedule 1 of FEMA 20 (R)). Attachments to be provided in the attachment “other attachments” in the tab 5 of the form. ADD Investor Upon filling all above details, click on the “ADD investor” check whether the details are reflected in the adjoining table (at the bottom) and verify the same. In case any of the details entered needs to be modified click on the edit icon under “Edit/Update” head of the table. This would populate the details in the respective fields. Modify and then click on “Save” button, this will save the details in the table again. Repeat the process in case of multiple investors. Tip : Please select the “Nature of issue” in tab 1, before entering the investor details. The investor details are erased in case “nature of issue” selected after. Fair value of the Shares (in Rs) Fair value of the shares as per the valuation certificate issued by the person authorized as per FEMA 20 (R) along with the attachment at “Valuation Certificate”. Mandatory where nature of issues is “Preferential Allotment/Private Placement/Private arrangement” and “Conversion of Convertible Notes”. Please select “Yes” upon completing all details in the form. 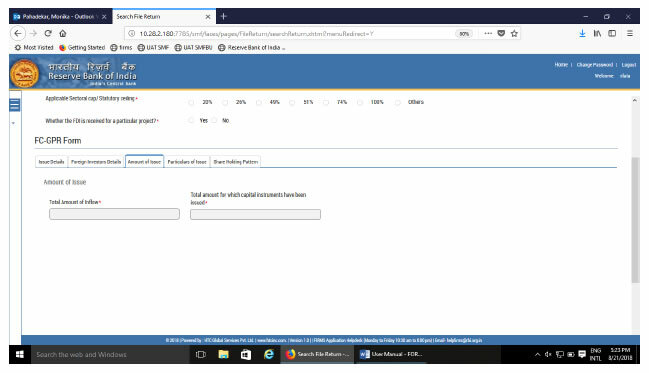 Attach the Declaration and CS certificate as well as other relevant documents in the attachment “CS certificate/other attachments”. Post transaction values are auto-calculated based upon the details provided in the form. Post transaction=Pre transaction value of shares + Value of shares reported in the form. The Business user shall ensure that the details are correctly filled in the form, so that the shareholding pattern which is auto- calculated is correct. 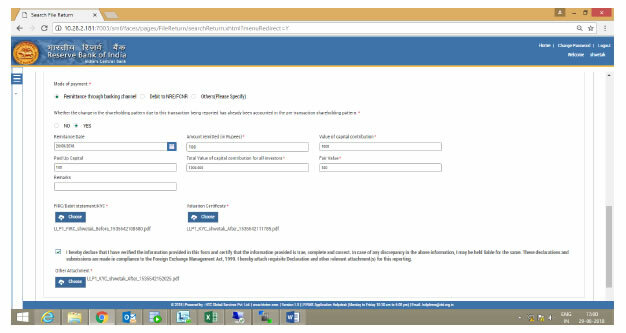 Step 5.6: After filling in all details, click on Save and Submit for submitting the form. 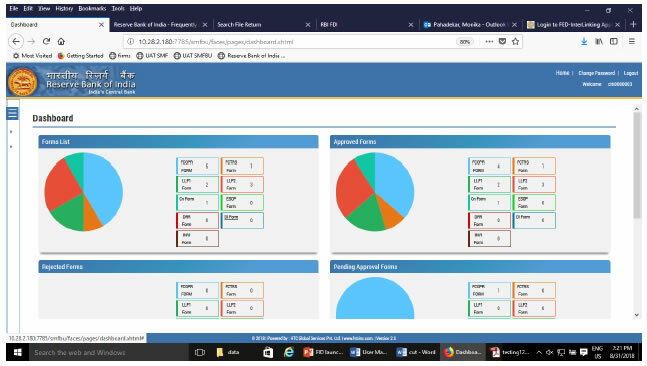 “Save as draft” feature: The Business User can also save the draft and submit later, by filling in all mandatory details in the “Common details” page. “Reset” feature : This will reset the complete form. “Back” button: To go back to the Dashboard. Step 2 : Click on drop down menu “Return Type”. Select “Form FC-TRS” and click on Add new return. The user will be taken to form FC-TRS. 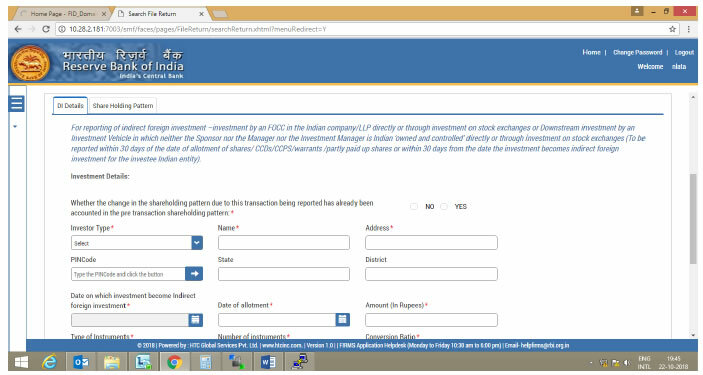 The complete form is arranged into two parts, Common Investment details and “Form FC-TRS” which is further arranged into 3/4 tabs. Whether the foreign investment received is for a specific project/ manufacturing unit/ plant? Select Yes or No as applicable. Date of Transfer Select the date of transfer from the calendar. 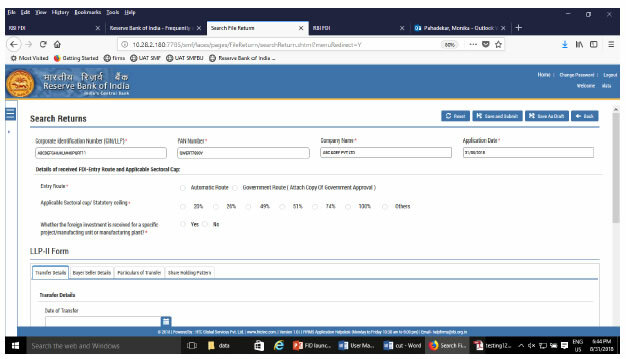 (In case the date of transfer is after the date of filing of FC-TRS form i.e future date, select the date as application date and provide the date of transfer as per the Transfer agreement as an attachment under “Other attachments”). Buyer and Seller details for sale or Donee and Donor details for gift Fill up the buyer and seller details for transfer by sale or Donee and Donor details for Transfer by Gift. Number of Instruments Enter the number of instruments as transferred. Conversion ratio In case of Equity shares, partly paid up shares, shares transferred as Gift, participating interest/rights in oil fields enter as 1:1. For CCDs /CCPs/ share warrants enter the pre-fixed upfront conversion ratio. (In case there is no upfront conversion ratio enter the ratio as per the maximum permissible conversion of CCDs/CCPs/share warrants into equity shares in compliance to the pricing guidelines). For participating interest/rights in oil fields enter the value as 0 (zero). Transfer price per instrument Transfer price. For Gift, enter transfer price as 0 (zero). Total amount consideration Auto-calculated as Number of instruments multiplied by transfer price per instrument. “ADD” button Click on the ADD button after entering above details and check that all details are reflected in the adjoining table. In case of multiple instruments being transferred repeat the above process. In case the entered details needs to be modified click on the Edit icon in the table. The details would be re-populated in the fields, modify accordingly and click on Save Button. Check for the details in the adjoining table. In case the details needs to be deleted click on the Delete icon in the table. In case of Gift, the field may be kept blank. Name of AD bank Click on the search icon. A pop-up window will open, select the AD bank facilitating the transfer. Address of the AD bank Address is auto-populated based on bank selection. In case the address is not correct, edit the details accordingly. Date of remittance Enter the Date of Remittance. In case the remittance date is future date, it may be left blank. Amount in previous tranche(s) Enter the total amount as received in all earlier tranche(s). Date of Remittance Enter the date of remittance. Whether the remitter is different from a foreign investor Please select “NO” if the remitter is same as the foreign investor. Check upon completing all details in the form. Step 2 : Click on drop down menu “Return Type”. Select “Form LLP-I” and click on Add new return. The user will be taken to form LLP-I. The complete form is arranged into two parts, Common Investment details and “Form LLP-I” which is further arranged into 5 tabs. Remittance details Select the name of the AD bank through which the remittance has been received. Enter the address and select the PIN code through the search option. State and City are auto-populated. In case the state or city auto-populated is not correct, edit the same accordingly. Value of Capital contribution Value of capital contribution by the person resident outside India in the LLP. 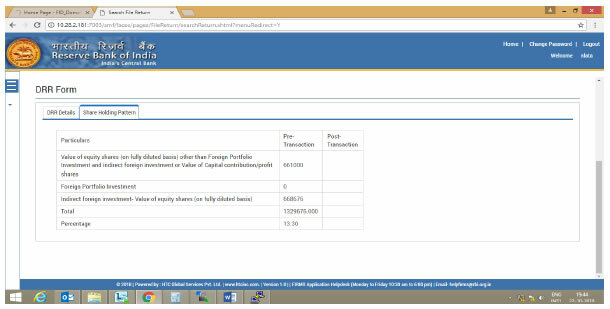 Total Value of Capital contribution in Rs for all investors In case where the capital contribution is being received at the same date from multiple foreign investors and the applicant wishes to file for all investors in one form LLP-I, enter the total value of capital contribution for all such foreign investors. For entering the details for other foreign investors, file another form LLP-I as the LLP-I has the provision of entering only one investor details. Remarks Enter remarks if any. Declaration and other attachments Declaration text -I hereby declare that I have verified the information provided in this form and certify that the information provided is true, complete and correct. In case of any discrepancy in the above information, I may be held liable for the same. These declarations and submissions are made in compliance to the Foreign Exchange Management Act, 1999. I hereby attach requisite Declaration and other relevant attachment(s) for this reporting. Select the check box and attach other documents, if any. 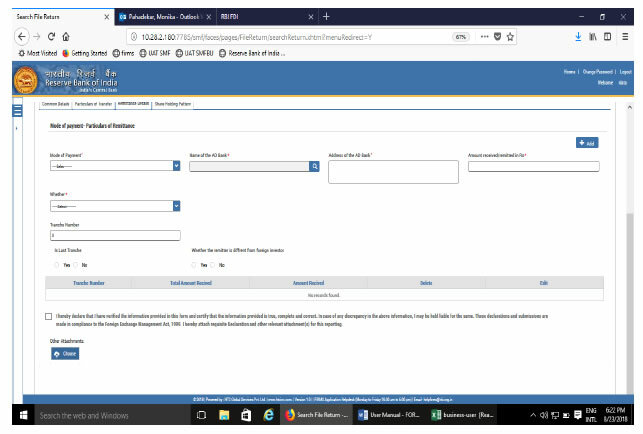 Step 4.3: After filling in all details, click on Save and Submit for submitting the form. Step 2 : Click on drop down menu “Return Type”. 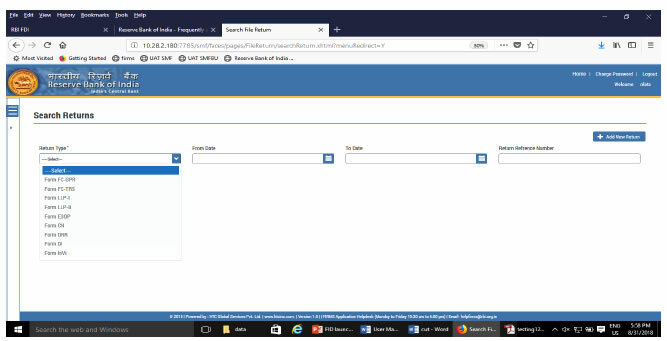 Select “Form LLP-II” and click on Add new return. The user will be taken to form LLP-II. The complete form is arranged into two parts, Common Investment details and “Form LLP-II” which is further arranged into 4 tabs. Transfer of capital contribution/profit shares from a person resident outside India to a person resident in India [including NRI/ OCI or eligible investor under Schedule 4 of FEMA 20(R)]. Upon selection of this option enter the amount of outflow in Rs and attach the relevant acknowledgement letters, if any. Upon selection of this option enter the amount of inflow in Rs and attach the relevant acknowledgement letters, if any. Whether the change in the shareholding pattern due to this transaction being reported has already been accounted in the pre transaction shareholding pattern:* Select Yes or No accordingly. In case the total payment has been received through multiple modes of payment, select multiple check boxes accordingly. Declaration Declaration text- I hereby declare that I have verified the information provided in this form and certify that the information provided is true, complete and correct. In case of any discrepancy in the above information, I may be held liable for the same. These declarations and submissions are made in compliance to the Foreign Exchange Management Act, 1999. I hereby attach requisite Declaration and other relevant attachment(s) for this reporting. 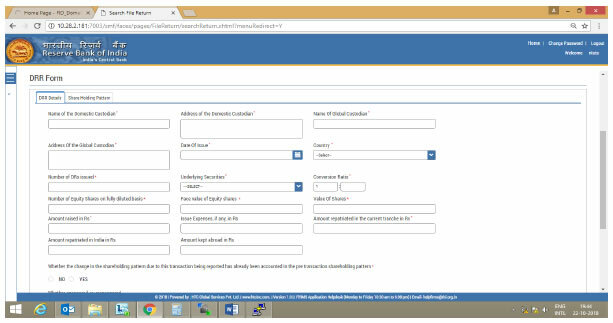 Step 4.5: After filling in all details, click on Save and Submit for submitting the form. 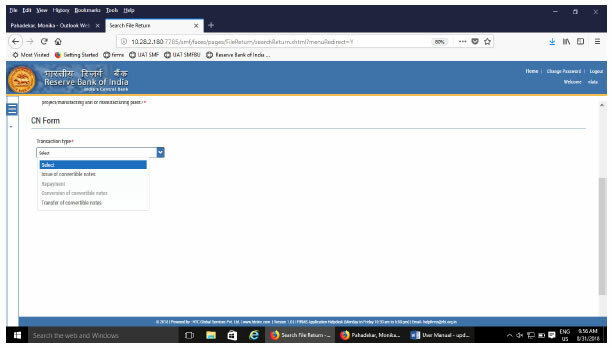 Remittance Details- Name of the AD bank and address Select the name of the AD bank from the available option, other details are auto-populated based upon selection. If the details are not correct, the same may be modified accordingly. The field is editable. Attachments : FIRC or debit statement as applicable and KYC. In case the payment is being made through multiple modes, select multiple check boxes, and enter the date of remittance as the earliest of the date of remittances. The amount of remittance is the total amount of remittance through all modes. Once the above details have been filled, click on ADD investor. Declaration text and other attachments Declaration text I hereby declare that I have verified the information provided in this form and certify that the information provided is true, complete and correct. In case of any discrepancy in the above information, I may be held liable for the same. These declarations and submissions are made in compliance to the Foreign Exchange Management Act, 1999. I hereby attach requisite Declaration and other relevant attachment(s) for this reporting. Check the declaration text and attach other attachments, if any. Step 5.1.1: After filling in all details, click on Save and Submit for submitting the form. Date of transfer Select the date of transfer. In case, it is a future date select the current date. Details of the AD bank Select the name of the AD bank facilitating the transfer and check for the address. If the same is incorrect, modify the same accordingly. Step 5.2.2: After filling in all details, click on Save and Submit for submitting the form. Step 2 : Click on drop down menu “Return Type”. Select “Form ESOP” and click on Add new return. The user will be taken to form ESOP. The complete form is arranged into two parts, Common Investment details and “Form ESOP” which is further arranged into 2 tabs. Conversion Ratio Enter the conversion ratio as per which the shares would be issued upon exercise of the ESOPs. In case of an ADR/GDR linked ESOP, enter the convertion ratio on a fully diluted basis. For example, if the as per the scheme 1 ESOP has an underlying of 2 GDRs and GDRs in turn has underlying of 10 equity shares, than the conversion ratio would be 1: 20. In case Yes is selected then there will not be any change in the shareholding pattern for this transaction being reported. In case No is selected, a field for Paid up capital on fully diluted basis will pop-up. Enter the paid up capital value on fully diluted basis. The changes would be reflected in the shareholding pattern for this transaction being reported accordingly. An intimation message would Pop-up as “The applicant may file form FC-GPR as and when the ESOPs are exercised. If the ESOPs are linked to ADR/GDR, form DRR may be filed upon exercise of such ESOPs”. Please click Yes and form submission is complete. Step 2 : Click on drop down menu “Return Type”. 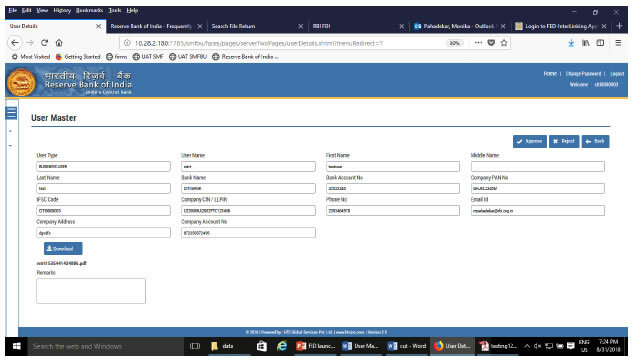 Select “Form DI” and click on Add new return. The user will be taken to form DI. The complete form is arranged into two parts, Common Investment details and “Form DI” which is further arranged into 2 tabs. Date on which the investment become Indirect foreign investment Select the date on which the investment by the resident investor in the indian Investee company became indirect foreign investment for the investee company, as per Regulation 14 of FEMA 20(R). Date of allotment Select the date on which the capital instruments were issued to the resident investor by the Indian investee company. This date would be same as Date on which the investment become Indirect foreign investment if the investment by resident investor is downstream investment, in terms of Regulation 14 of FEMA 20(R), at the time of allotment itself. Type of instruments Select from the type of instrument, drop down menu. Number of shares on a fully diluted basis Auto-filled as per the number of instruments and conversion ratio. Face value of equity shares Enter the face value of the equity shares. Check upon completing all details in the form and attach, any other document (s), if any. Step 2 : Click on drop down menu “Return Type”. Select “Form DRR” and click on Add new return. The user will be taken to form DRR. The complete form is arranged into two parts, Common Investment details and “Form DRR” which is further arranged into 2 tabs. Address of the Global Custodian Address of the Global custodian for the DR issue. Conversion Ratio Conversion for the DRs issued. Where the underlying security is other that capital instruments i.e. debt or units, conversion ratio shall be 1:0. Amount raised in Rs Total amount as raised in the DR issue being reported. Issue expenses, if any, in Rs Issue expenses as incurred in the DR issue, if any. Amount repatriated in the current tranche in Rs The amount as being repatriated in India so far. Declaration Declaration text- I hereby declare that I have verified the information provided in this form and certify that the information provided is true, complete and correct. In case of any discrepancy in the above information, I may be held liable for the same. These declarations and submissions are made in compliance to the Foreign Exchange Management Act, 1999. Check upon completing all details in the form and attach other documents, if any. Step 4.4.1: Using the left navigation button select File Return and then Single Master Form. Step 4.4.2: Select Return Type as Form DRR. 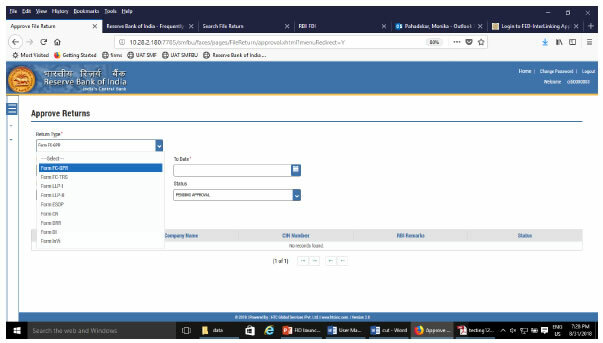 If the reference number of the earlier filed form DRR is known, enter the same in the field Return Reference Number and click on search return. Or else, enter the From date and search return. 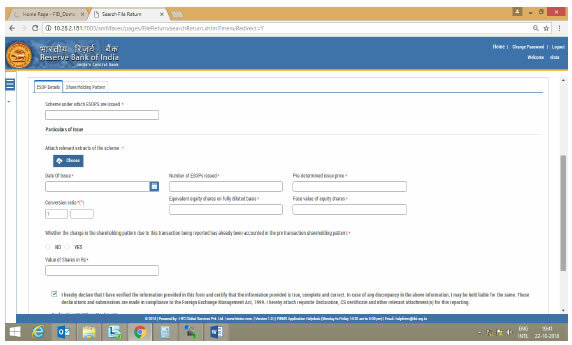 Select the initial filed Form DRR and open the same upon clicking on the reference number. Step 4.4.3: At the top right select the button “ADD subsequent return”. Enter the amount Amount repatriated in the current tranche in Rs. No other field needs to be entered. The values in Total amount repatriated in India and the Amount kept abroad are updated accordingly. Check the details under the tab “Tranche details”. Step 4.4.4. Check the declaration and attach the FIRC for the amount repatriated in the “Other attachments” and click on “Submit” button at top right. 1. Shareholding pattern details are being obtained with the purpose to ensure that the foreign investment in an entity is within the permissible foreign investment limit/ sectoral caps/regulatory limits. 2. In the entity master, the companies and LLPs were instructed to provide the latest shareholding pattern, all inclusive irrespective whether the same is reported or not reported or acknowledged or not acknowledged. 3. 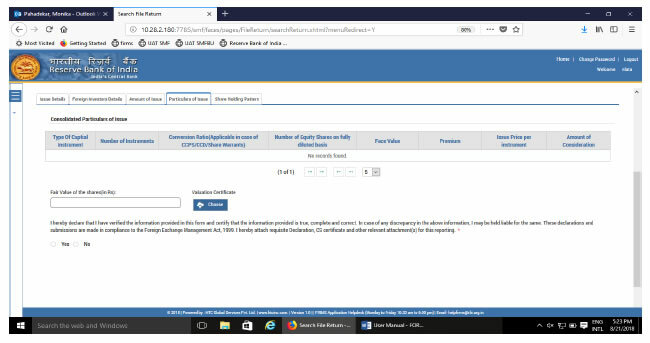 In case where the company or LLP is making a filing in SMF for a past transaction which was not reported earlier, but the same has been included in the shareholding pattern provided in the Enitiy master, at the time of reporting the same in SMF, the shareholding pattern should not change. In such scenarios, the BU, where he is asked to specify “Whether the change in the shareholding pattern due to this transaction being reported has already been accounted in the pre transaction shareholding pattern:” shall select YES. This would ensure that the shareholding pattern is not affected. 4. 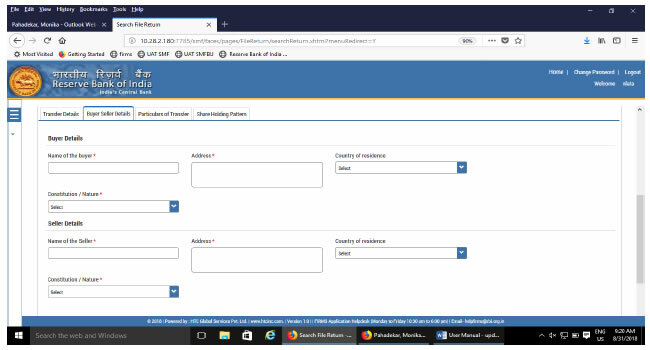 It may be noted that upon successful acknowledgement of the filed forms at AD level, the entity master details are automatically updated with the post shareholding pattern as per the acknowledged form. Therefore, the user shall take due precaution while specifying for this detail. 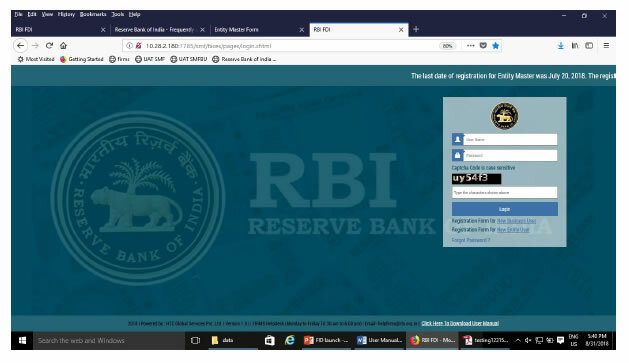 Step -1 Using the left navigation button select user verification and then RBI user master. 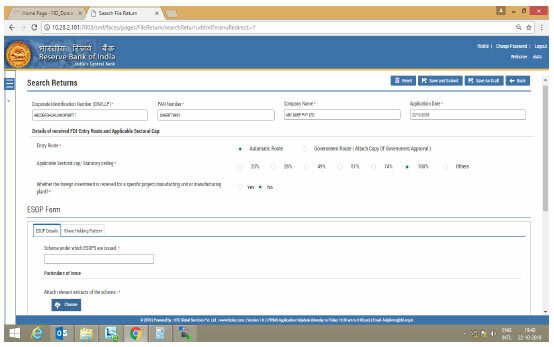 All pending approvals for eKYC would be displayed. Step 2: Click on the View Button to see all the details for the Business User. Step 3: Download the authority letter using download button. Step 4: Verify the details as entered with the authority letter. Approve or Reject the registration accordingly. An email notification would be sent to the applicant accordingly. AD bank will have 3 working days for verifying the eKYC of the Business User. Step 2 : Select the return type, enter the from and to date and select the status as pending approval and click on search return. All form of the return type would be displayed. Select the form as desired. 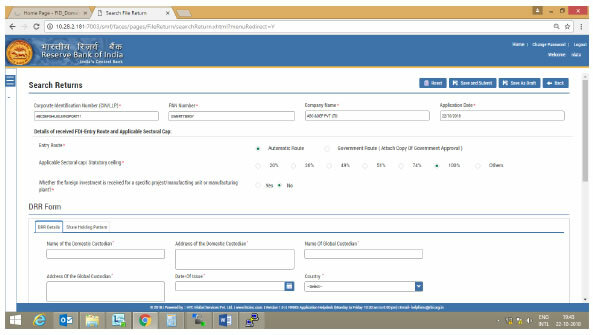 The form will open up with all details as filed by the Business user along with the Entity details and Check list. 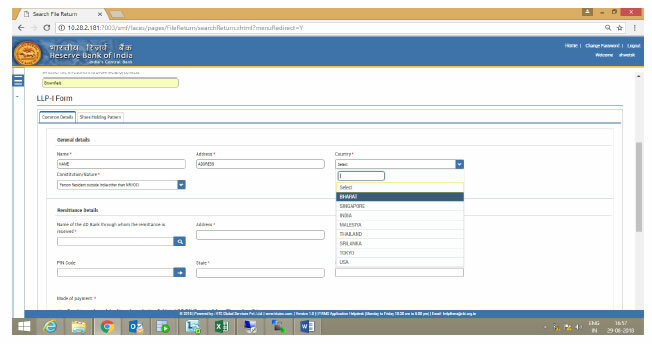 Step 3: Go through the details as filed by the Business User and verify the same with attached documents. Procedure of scrutiny: The checklist provides the details that needs to be verified for acknowledging the filed return. A set of checklist as applicable to that particular return is being provided to the AD bank along with the filed form. AD bank is required to check only those details and if found to be in order, approve the return. 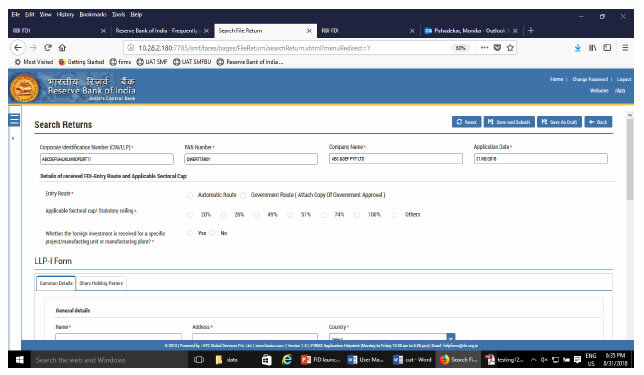 In case the Business user has not provided the details, AD Bank shall reject the form. It may be noted that there is no provision for resending or attaching any clarification once the form is submitted. Therefore, AD may take due caution while approving or rejecting the same. In exception cases where for the specific reasons the AD needs to refer the form to RBI, AD may select the Regional Office from the drop down menu, enter the reasons for referring it to RBI under “remarks” field and click on Send to RBI. RBI would provide the advice on whether the form be approved or rejected to the AD bank. The final acknowledgement and rejection would be then made, accordingly, by AD bank. AD bank will have only 5 working days for approving or rejecting the form or sending it to RBI. Helpdesk for FIRMS to receive queries from stakeholders regarding entries to be made in FIRMS. for technical queries : Please click here to send email.